The corpus of work produced by Muzafer Sherif, including the Boys’ Camp Studies, reminds us that groups have both a material reality and psychological validity. This work directs us to examine group processes and intergroup relations at the appropriate group and intergroup level. And it admonishes us to achieve these ends through sound conceptual clarity. The Boys’ Camp Studies themselves remain a valuable model for creating psychologically meaningful groups with, among other things, histories, norms and real intergroup relations. They highlight the theme that runs through all of Sherif’s work, that individual behaviour – made possible only through individual minds – cannot be understood through analyses of those individual minds removed from the social context. How do you write yet another review of Muzafer Sherif’s well-known Boys’ Camp Studies, and still manage to say something new? The answer came to us through two otherwise unrelated occurrences. The first of these arose while reviewing Granberg and Sarup’s (1992) excellent biography of Sherif. Through this we learned that two of social psychology’s intellectual heroes, Muzafer Sherif and Gordon Allport, failed to see eye-to-eye when it came to their choice of the appropriate level of analysis for studying group processes, including prejudice. Gordon, much like his brother Floyd, sought explanations of prejudice through analyses of individual psychologies. To be sure, Allport considered societal-level explanations, but for Sherif, ‘Allport’s approach to social psychology was too individualistic’ (Granberg & Sarup, 1992, p.8). Allport, in turn, considered Sherif’s work to be ‘unnecessarily collectivistic’ (Allport, 1958, p.39). The second occurrence came to us as we reflected on e-mail alerts we received from Psychological Science. Here we noted that one of the most downloaded recent articles had proposed that prejudice is caused by low cognitive abilities. Long after Sherif, it appeared that authors continued to advance the individualistic thesis. We found ourselves transported back in time precisely to the Sherif–Allport debate. If we take Allport’s metatheoretical framework to be grounded in ideological liberalism and values of tolerance and individual agency, Sherif’s metatheoretical framework must surely be more radical. For us, that is certainly the case. And, yet, in our own response to this recent individualistic research, we found ourselves in a position that Sherif must have felt in his debates with Allport. Here before us stood solid scientific work, conducted by people of integrity who have made important contributions to the field, and who clearly share our broad scientific and political values. Yet we disagree. This is a disagreement that we were mindful of as we wrote this article, and it is one that inspired us to try to add something new to what has been said before. Of course, as a psychologist, Sherif saw the individual’s ‘perception of the social world’ as a key focus of his analysis (Sherif & Sherif, 1969, p.8). However, in his thinking (and that of his colleague and wife, Carolyn), the individual should not be conceived in isolation from the rest of the world, but as interdependent with it, so that the individual ‘is not merely the recipient of sociocultural influences…[but] is an active participant in the creation of social influences’ (Sherif & Sherif, 1969, p.9). For Sherif, the study of intergroup relations, including stereotypes, prejudice and discrimination, was necessarily collectivistic. So what are the contributions that can be garnered from Sherif’s work? One answer to this can be found in a web search for joint references to ‘Robbers Cave’ and William Golding’s Lord of the Flies – a search that generates well over 20,000 hits. Although most of us may envy the impact that Muzafer Sherif has made outside of psychology, this conjunction in the popular mind is, frankly, tragic. Golding’s narrative fictionalised degenerative consequences of the lack of formal norms within group life; it remains an ideological commentary that assumes fundamentally base human motives. Sherif’s science, in contrast, revealed the interdependent nature of collective life and individual psychologies. It exposed the necessarily collectivistic nature of the development not only of intergroup prejudice and hostility, but also of intergroup harmony and reconciliation. Sherif’s participants did not become savages. Good fiction should not be conflated with good science. It is a rare psychology student who has not heard of the famous Boys’ Camp Studies. Because of their broad familiarity, we will only briefly review the studies’ methods and findings before discussing their lasting contributions. However, we do note the less well-known fact that it was not Muzafer’s idea to test the hypotheses in the context of a boys’ camp; it was Carolyn’s. Muzafer and Carolyn were an important and productive team. And, yet, the lesser-known extent of Carolyn’s contributions is, most likely, a reflection itself of a different type of intergroup relationship within our broader field. Three Boys’ Camp Studies are reported in the literature; Table 1 outlines their basic methodological structures. Typically, discussions of these studies highlight three critical phases. However, as can be seen, we have currently relabelled the phases to emphasise particular aspects of the work. The first real phase of the studies was the selection of participants. Sherif did not rely on convenience samples, nor did he sample randomly. Instead, he selected intentionally to maximise the homogeneity of his samples. He wanted to ensure that alternative explanations for his results could not be proffered on the basis of a priori intergroup enmity, individual differences (including cognitive abilities) or experienced (excessive) frustration and prejudice. His research team achieved these goals through extensive psychological testing, interviews with family and teachers, and actual observations of the boys (in the final study) as they played in the school-yard. The second phase, typically reported as part of Phase 3 in our table, occurred in the first two studies at the time when the camp actually started. Here, all participating boys were brought together in a situation that allowed them to form interpersonal friendships. This phase is crucial, yet often overlooked. Subsequent interviews with some of the experimenters and some of the actual participants (as adults) revealed, for example, that the 1953 study did not progress in the manner that Sherif anticipated; instead of intergroup animosity, there was a spirit of sportsmanship, reconciliation and intergroup helping. The two groups of boys simply did not form strong intergroup hostilities and prejudice following intergroup competition. This, in turn, became sufficiently problematic that the experimenters simulated a raid on one of the cabins so that the boys would blame the outgroup. Although we may now question the wisdom of this breaking of experimental protocol, the inclusion of this phase, contrasted with its absence in the 1954 study, provides an important type of experimental manipulation in its own right. The interpersonal friendships and an overall shared, inclusive sense of ‘us’ framed subsequent intergroup competitions as more friendly than hostile. This, indeed, is precisely what was observed in a separate independent replication (Tyerman & Spencer, 1983). The hostilities that ultimately emerged from intergroup competition thus did so in the absence of this shared, common ingroup frame of reference. The third phase is the one in which the two groups were finally created, and intragroup interdependencies, norms, roles and social identifications emerged. This was followed by the crucial fourth phase of intergroup competition for limited and valued resources. Pocket knives and trophies were awarded to winning groups, while losing groups received nothing. Here, and particularly in the most famous Robbers Cave Experiment of 1954, stereotypes, prejudices and discrimination clearly developed. Indeed, in stark contrast to the studies in which interpersonal friendships and shared common identities were able to form first, experimenter notes from this final experiment suggest that the increased hostilities actually threatened to destabilise the experiment. Finally, the fifth phase of the experiment instituted procedures to try to bring about intergroup harmony. The greatest animosity was, again, in the Robbers Cave Experiment, so it was this study that required the most involved conflict-resolution strategy. An initial bringing together of the two groups in the absence of positive intergroup interdependence failed to produce beneficial outcomes. It was not until the two groups were forced to cooperate in order to achieve a series of superordinate goals that the hostilities subsided and boys from both groups united as friends. Needless to say, despite the intrigue, interest, and basic scientific contributions of Sherif’s studies, they have been subject to their fair share of theoretical, methodological and ethical criticism over the past half-century. We have reviewed some of the criticisms elsewhere (Platow & Hunter, 2001, 2012), so currently we simply recognise that the studies are not without fault. Despite this recognition, however, we remain convinced that Sherif’s work made substantial contributions to our discipline. Indeed, expanding on our earlier summary of lessons to be learned from these studies, Sherif and his colleagues showed us that groups do have a material reality (Lesson 1). This reality is both created and manifest through interdependencies, norms, roles and status differences. In addition, however, Sherif’s work taught us that groups have a psychological validity (Lesson 2). People identify with their ingroup, and adopt their ingroup’s goals as their own personal goals. They experience the emotional highs and lows associated with their group’s successes and failures. And they see the world through the lens of their group membership. In this way, intergroup impressions (e.g. stereotypes), attitudes (e.g. prejudice) and behaviours (e.g. discrimination) become psychologically meaningful outcomes of the nature of intergroup relations (Lesson 3). Intergroup competition for limited and valued resources, in and of itself, can produce negative stereotypes, prejudice and discrimination. Intergroup cooperation for a superordinate goal, in contrast, can change these stereotypes for the better, and reduce the prejudice and discrimination; indeed, simple intergroup contact alone is not sufficient to reduce intergroup hostility once it has arisen. In addition to these social-psychological lessons, we can identify broader intellectual contributions of the Boys’ Camp Studies. The first reiterates that Sherif’s studies highlighted the necessity of studying intergroup behaviour at the appropriate level of analysis. If there is one feature that emerges repeatedly throughout Sherif’s work, it is that group processes and intergroup relations should be studied at the group level, not the individual level. It is a powerful imperative, and underpins, among other things, the entirety of the social identity tradition that followed Sherif. Of course, if our theoretical questions are posed at an individual level, then individual-level accounts are most appropriate. And yet, Sherif also recognised that individual behaviour – made possible only through individual minds – cannot be understood through analyses of those individual minds removed from the social context. The social context moves us, compels us, frames our motivation, attention and interpretations; it affects our thoughts, feelings and behaviours. We never exist outside of a social context, so decontextualising psychological processes is both fruitless and, in reality, impossible. Of course, as we noted from the outset, the individualistic-collectivistic, Sherif–Allport debate is still alive today. Ultimately, it can only be partially resolved empirically; it remains, primarily, conceptual. This is why sound experimental methods can produce results supporting each metatheoretical claim. But sound experimental methods require sound conceptual clarity. This, indeed, is the third intellectual contribution of Sherif. The first task that confronted Sherif and colleagues was the translation of their broad conceptual notions of groups and intergroup relations into specific experimental practices. This translation required the clearest possible theoretical statements. Definitions, disciplinary assumptions, and clearly stated hypotheses permeate Sherif’s work. Indeed, his 1969 textbook with Carolyn is the only social psychology textbook we know of in which basic assumptions are clearly stated (two whole chapters are dedicated to this). Finally, we should not forget that, despite all of the criticisms that can be, and have been, levelled against the Boys’ Camp Studies, Sherif and his colleagues provided us, at minimum, with a model for creating psychologically meaningful groups with, among other things, histories, norms and real intergroup relations. This is no small legacy. Most social psychologists (ourselves included) fail to generate anything close to the material reality and ego-involvement of the Boys’ Camp Studies. And when the bold among us do try, they are quickly and vigorously attacked (often unreasonably) for their unscientific methods and lack of ethical standards. But what really adds to a deep and lasting understanding of the social psychology of intergroup relations? A laboratory study of ad-hoc group processes or a three-week summer camp experiment on intergroup conflict and cooperation? At the risk of our next academic promotion, it is, without question, the latter. So, we should all examine Sherif’s methods, and with the value of hindsight, improve upon them. Let them inspire us to pursue deeper questions that are more theoretically involved and more practically compelling. Sherif’s studies tell us that psychologists can be naturalists: we can observe the natural world, formulate hypotheses about that world, and do our best to recreate that world with all its complexities to evaluate our assumptions critically and fully. He was an avid anti-Nazi. His passion saw him imprisoned in Turkey, and clash with more senior academics. And this passion led him to produce, along with his colleagues, a body of social-psychological theory and research that remains central to our discipline decades after it was completed. The Boys’ Camp Studies, in particular, remain seminal and essential reading. For all their faults, the studies stand, the lessons remain, and their contributions guide us even today. For our own part, we see the intellectual trajectory from the gestalt psychologists, to Sherif, to contemporary social identity and self-categorisation theorists as natural, logical, and powerful (Platow et al., in press). In the end, Sherif’s work should encourage us to reflect upon the value of conceptually clarifying the level of analysis at which we work, and (better still) recognising the necessary collectivistic nature of the study of intergroup relations. Allport, G.W. (1958). The nature of prejudice. Garden City, NY: Doubleday. Granberg, D. & Sarup, G. (1992). Muzafer Sherif: Portrait of a passionate intellectual. In D. Granberg & G. Sarup (Eds.) Social judgment and intergroup relations: Essays in honor of Muzafer Sherif (pp.3-54). New York: Springer-Verlag. Platow, M.J. & Hunter, J.A. (2001). Realistic intergroup conflict: Prejudice, power, and protest. In M. Augoustinos & K. J. Reynolds (Eds.) Understanding the psychology of prejudice and racism (pp.195–112). London: Sage. Platow, M.J. & Hunter, J.A. (2012). 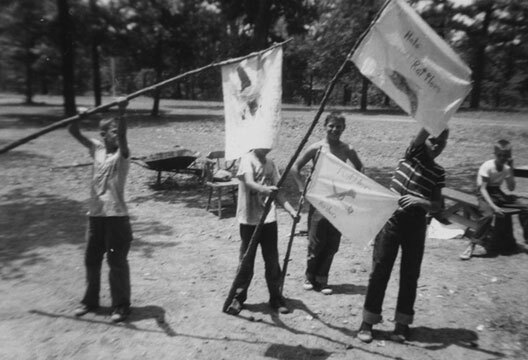 Intergroup relations and conflict: Revisiting Sherif’s boys’ camp studies. In J.R. Smith & S.A. Haslam (Eds.) Social psychology: Revisiting the classic studies (pp.142–159). Los Angeles: Sage. Platow, M.J., Hunter, J.A., Haslam, S.A. & Reicher, S.D. (in press). Reflections on Muzafer Sherif’s legacy in social identity and self-categorization theories. In A. Dost-Gozkan & D.S. Keith (Eds.) Norms, groups, conflict and social change: Rediscovering Muzafer Sherif’s psychology. Edison, NJ: Transaction. Sherif, M. (1951). A preliminary experimental study of inter-group relations. In J.H. Rohrer & M. Sherif (Eds.) Social psychology at the crossroads (pp.388–424). New York: Harper & Row. Sherif, M. (1967). Social interaction: Process and products: Selected essays of Muzafer Sherif. Chicago, IL: Aldine. Sherif, M. & Sherif, C.W. (1969). Social psychology. New York: Harper & Row. Sherif, M., Harvey, O.J., White, B.J. et al. (1961). Intergroup conflict and cooperation. Norman, OK: University of Oklahoma Book Exchange. Sherif, M., White, B.J. & Harvey, O.J. (1955). Status in experimentally produced groups. American Journal of Sociology, 60, 370–379. Tyerman, A. & Spencer, C. (1983). A critical test of the Sherifs’ Robber’s Cave experiments. Small Group Research, 14, 515–531.